Some of you may be wondering what I mean by this. Of course a Kindle Fire can be networked, it’s got a built-in WiFi interface. Yes, but that’s not what I mean. Instead, it’s now become my favorite way to read both technical and non technical books. 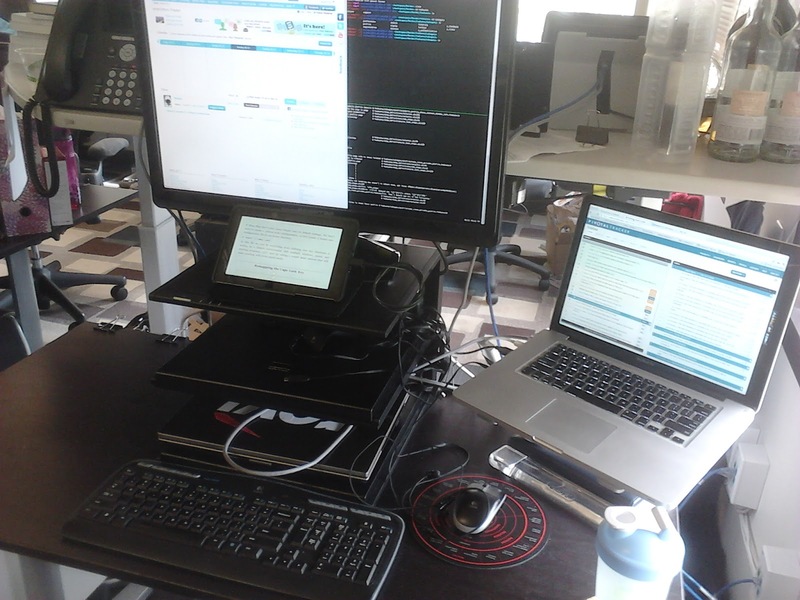 Using a Kindle Fire as a standalone documentation window. The Kindle Fire is the device sitting just below my large monitor. Why do i have it set like this? It makes for an excellent place to read something technical and place it right at eye level when I’m working. It makes it easier for me to see and compare what is on the page and what I am actively working with. It lets me shift from book to book without my having to clutter up my physical desk or my computer screen. While those are all good, the best benefit actually turns out to be what I now call the “Zed Shaw Effect” or “Hard Way Effect” (ZSE, HWE, sorry, there’s no cool acronym there). What are those? The fact that I can see the text, I can read the text, I can ponder the text, but I cannot copy and paste the text. From working through Learn Ruby the Hard Way, I am now a firm believer that, if you want to learn a technical concept, you have to do it, not just read it, and seriously, you need to type that sucker out. That means making typos. It means cussing a little under your breath. It means re-doing what you thought you did correctly. It means you actually learn it by struggling a bit with it. There’s lots of reasons why a Kindle Fire may be a good investment for you (or hey, fill in the blank with your favorite tablet, the Fire just happens to be what I have). This, above, is my #1 reason :).